Event time: From 6pm. to 8pm. 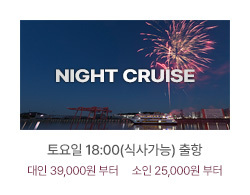 Adult 35,000 KRW(Per person) / Children(3-13years old) 25,000 KRW(Per person). 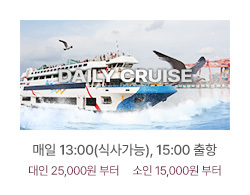 Cruise offers : Ara Waterway Cruise, Performances, Firework display, and simple foods such as fried chicken. Enjoy a delicious buffet on the water! Spectacular fireworks and music display! Get ready for the time of your life. 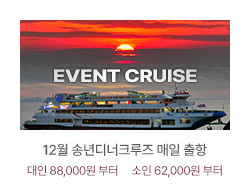 Adult 79,000 KRW (Per person) / Children(3-13years old) 55,000 KRW(Per person). Cruise offers : Ara Waterway Cruise, Performances, Firework display, and premium buffet. Copyright (c) 2015 Aracruise.co.kr All Right Reserved.